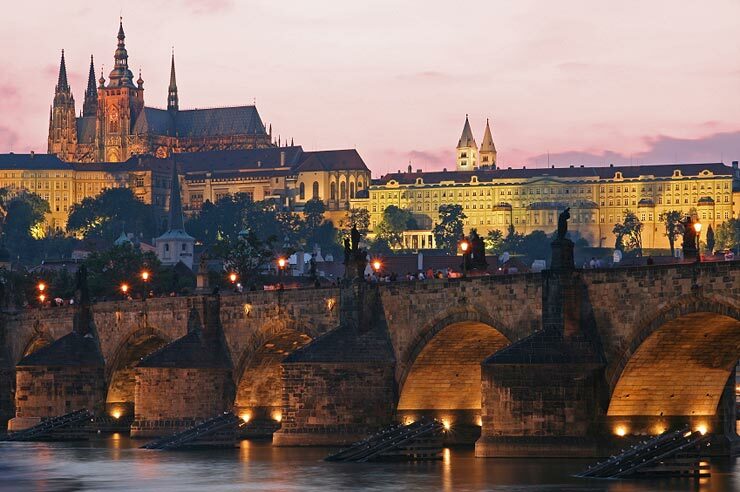 Prague definitely ranks up there amongst our favourite cities ever. It kind of took us by surprise how much we liked it, as we didn't really know what to expect. Unlike with cities such as Paris, Rome and London that you just know you're going to love before you've even set foot in them, we entered the Czech capital with indifferent expectations, and left it true Praha (its Czech name) lovers. It was just the perfect combination of majestic, fairy-tale buildings, lively streetlife, good shops, beautiful gardens...in short, a very well-rounded city. There's a lot to see and do, and we left it without seeing nearly as much as we wanted to in the day and a half we were there so we will absolutely, most definitely be back! Compared to other cities in Europe, Prague seemed to have an abundance of all the typical Western chains - Starbucks, McDonalds, KFC, etc. - which brought so much joy to our greedy little North American hearts. (As much as we loved Italy, we just could not love/get used to their idea of a coffee - everywhere you went, a cappuccino to go was watery and tepid, and served in the teensiest cup, like the sample size ones Starbucks gives out). But in addition to Starbucks, Prague has its own delectable cafe chain, Coffee Heaven, which received a hearty two thumbs up from us. The second afternoon, we somehow found ourselves in a kinda random part of town where Becky found this abandoned physics textbook from the '50s just chilling by a fountain. Despite it being (a) entirely in Czech, (b) weighing roughly fifteen pounds, (c) about PHYSICS (heheh sorry Becky, I know it's your major but that stuff ain't exactly a walk in the park!) and (d) potentially the precious property of some starving student who put it down for a split second with the intention of returning...she claimed it for her own, and named it Trotsky. And then we went in search of the Jewish Quarter...and oy vey, was it a trek! We got lost several times, the day was hot and we were very hangry, but eventually we found it, and its sombre beauty was definitely worth the hassle. And then it was back to the Town Square, which was thronged with people and even more charming by night!